It's the best time of the year for movie lovers: awards season. With the 91st Academy Awards just a few weeks away, now is the perfect time to plan an Oscars party your friends will be talking about for the next few months. If you've never been to an Oscars party, you'll love how easily this party can be dressed up (or down) depending on your preferences. Here's our guide to planning the perfect Oscars soirée this year. You can be as creative as you'd like with the theme of your invitations, whether you want to highlight your favorite movie up for an Oscar or keep it more classic Hollywood. Either way, sending them digitally (either via Facebook, evite, email-thread or group text) are a great way to go because it's eco-friendly and effective. Red carpet or Hollywood grunge? It's your party, so decide early on what type of event you'd like to host. If it's a more casual get-together, you'll want to skip the black tie and opt for more comfortable clothing. However, if you're searching for an excuse to dress up, announce red carpet attire as the official theme of your event, and encourage all your friends to dress to the nines. For a slightly more adventurous twist, suggest your friends dress like a nominated actor's character or one of their most iconic roles, and turn your party into a costume party to remember. Decorating your home is easy since Oscars night falls right after Valentine's Day. You can stock up on red plates, napkins, and décor for a fraction of the price once Valentine's merchandise goes on sale. If you're wanting to add a classier touch, opt for old-fashioned Hollywood glam styling with gold, black, and cream colored decorations. The most important part is your seating arrangements. Be sure you have a place for everyone to sit while watching the main event. One snack you'll want to have on hand at all times is popcorn...and plenty of it! Invest in a popcorn maker or stock up on bags of your favorite brand in advance. Champagne or wine is another popular option for keeping your party red carpet-worthy. If you're hosting a dinner party, ask your guests to each bring a dish to help cut down on cost, or cook something that's easy to serve, like lasagna or pasta. If your party is more casual, ordering a few pizzas is the perfect way for everyone to get what they want. Lastly, be sure you have the ingredients to serve the official drink of the Academy Awards: the Oscartini. The Oscartini consists of 1.5 oz. of Bacardi Limón, 1 oz. of Cointreau, 1.5 oz. of cranberry or pomegranate juice, a splash of Sprite, and a rim of edible gold flakes. Keep guests excited during the red carpet coverage by casting votes on who they think will win in each category. You can award prizes to anyone who wins in a category, or award the first, second, and third place winners. You can find all the nominees here. You can also add an extra level of fun by creating your own celebrity trivia game to play by searching for interesting facts about the nominees online. Award prizes to the winners and find out how much your friends really know about their favorite actors. A costume contest or best dressed contest is also appropriate during an Oscars party. Let everyone in attendance vote on the winner -- they not only win a prize but score bragging rights for the next year. Hollywood-themed party supplies: Make sure there's no doubt about where your guests are with these Oscar worthy party supplies, including plates, cups, napkins, and movie-themed photobooth props. Classic Hollywood décor: With fancy straws, shiny tassels and poms, and old Hollywood styled garland and balloons, this party kit is the perfect way to turn your home into a fancy get-together. Red carpet and paparazzi props: Your guests can arrive your party in style with a snazzy red carpet and paparazzi entryway. Hollywood Walk of Fame stars: Write all of your guests' names on these Hollywood-themed stars to show them they're the celebrities in your life. Party perfect Oscartini glasses: Serve Academy Award drinks in these stylish, modern martini glasses that your guests won't worry about breaking or knocking over. 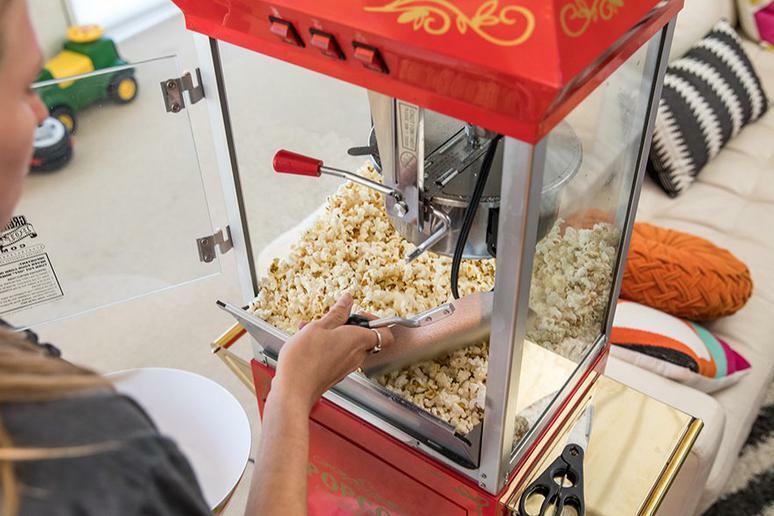 A nostalgic popcorn maker: You can rent a machine or use your microwave, but this nostalgic popcorn maker is a pop of nostalgia for your Oscars-themed party. Oscars trophies: Award winners of your Oscars games with their very own Oscar statuettes.